Drew Estate and Rocky Patel have once again combined their master blending techniques to create another coffee-infused hand-rolled premium cigar that’s like no other in the market today. 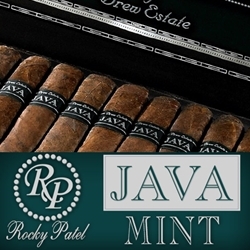 Rocky Patel Java Mint is the newest member of the Java cigar family, each are boxed-pressed with a special infusion of mint flavors blended into all-Nicaraguan long-filler tobaccos and binders wrapped perfectly inside a thick 3-year-aged Brazilian Mata Fina Maduro wrapper. Java Mint is crafted with the same chocolate and Mocha flavors as the original Java line but with an added mint flavor topped off with essence of vanilla. Smokers Discounts offers a “smoking dessert” style experience with Java Mint premium cigars by Drew Estate. With 90+ rated blends, Rocky Patel cigars are available at affordable prices for cigar connoisseurs everywhere! A variety of sizes and flavors are listed below at our discount online cigar store. Each of these styles are in stock and available. Call us for more details!